Doesn’t he look dapper, this cute crochet badger amigurumi? Almost a year ago I found in a local bookshop, this utterly amusing postcard with the portrait of a rather realistic badger wearing a striped sweater. It inspired me to make a little sweater pattern for Falun and of course I made a portrait of him wearing it. Some of you may even remember seeing it on my Instagram. It was my intention to add the pattern for that sweater to Falun’s pattern, but somehow it never really came to it. Because of the lovely reactions I got after posting another picture on IG where Falun was wearing the sweater, I decided to update the pattern as soon as possible. What has changed and what do you need to do if you already purchased the pattern? The pattern is completely updated. Falun’s original body was on the chubby side, so I rewrote that part and made a better looking version. There is also an instruction for an even slimmer body, which will fit the dapper sweater. And last but not least, the instruction for the cute sweater is included in the pattern. Good news for those of you who already have the pattern, you’ll receive an automatic update about this and can download the new version (for free) anytime you like, how about that! If you don’t have the pattern yet, you can buy it in my shop at Craftsy and Ravelry or order it from me here. Now go and make yourselves a bunch of dapper creatures. Have a lovely end of summer dear crafters! He certainly is a dapper fellow, Sonja! 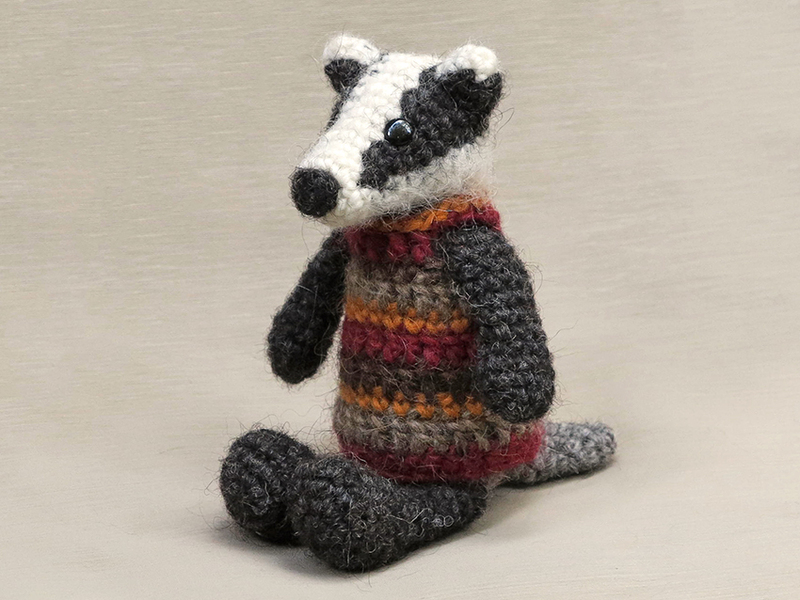 I gave my two badgers away, so will definitely have to make one now, with an equally dapper woolly! Thank you for the update and jumper pattern. Have fun! Every cloud has a silver lining, Sonja! Can’t wait! I like that word, too, Sonja. How about “natty”?